Sankofa Operating System also known as SankofaOS is a Free New Operating System specifically built for Ghana Schools but can also used for Production as well as Multimedia System. SankofaOS is 32 bits Linux distribution with Gnome Graphically User Interface. SankofaOS is 32-bit x86, developed on top of secure New SUSE Linux Enterprise 12.2. The Operating System is base on the new openSUSE 12.2 Linux Distros with advanced Graphical User Interface. The System was developed and built by Sankofa Software Group based in the USA. SankofaOS delivers lot of essential applications and seamless interoperability with your existing systems. What’s more, it gives users an easy-to-use and highly secure desktop experience. With application and multimedia enhancements, Green IT innovations and maximum interoperability and will help you reduce costs and increase productivity. Sankofa Operating System is more secured because it was built on top of secured Linux Kernel. 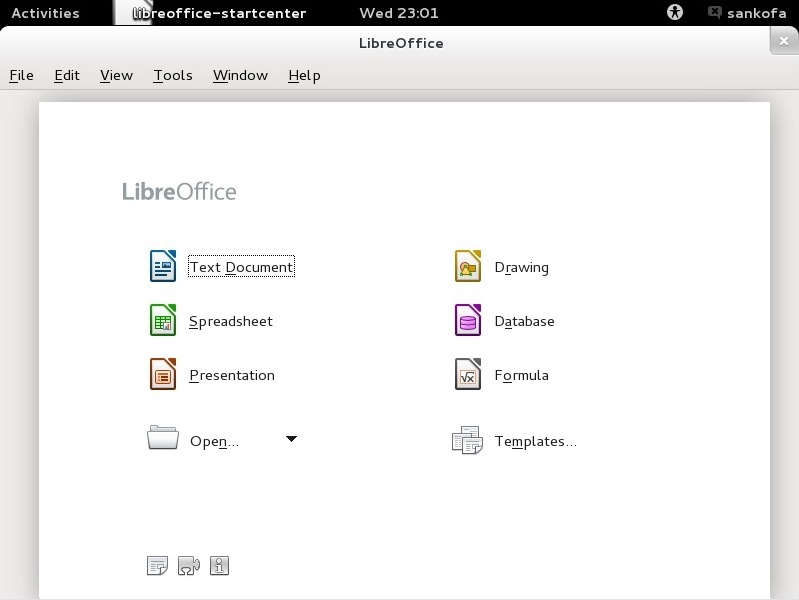 The operating System comes with a lot of open source software preinstalled. It has a lot of devices drivers installed and tested which will enable you to detect and configure you most hardware devices such sound cards, graphic cards TV tuner cards and Network adapter cards and wires network adaptors. It has a powerful plug and play API. Network connection is configured automatically on system boot. The system can be easily be updated online when connected to the internet. 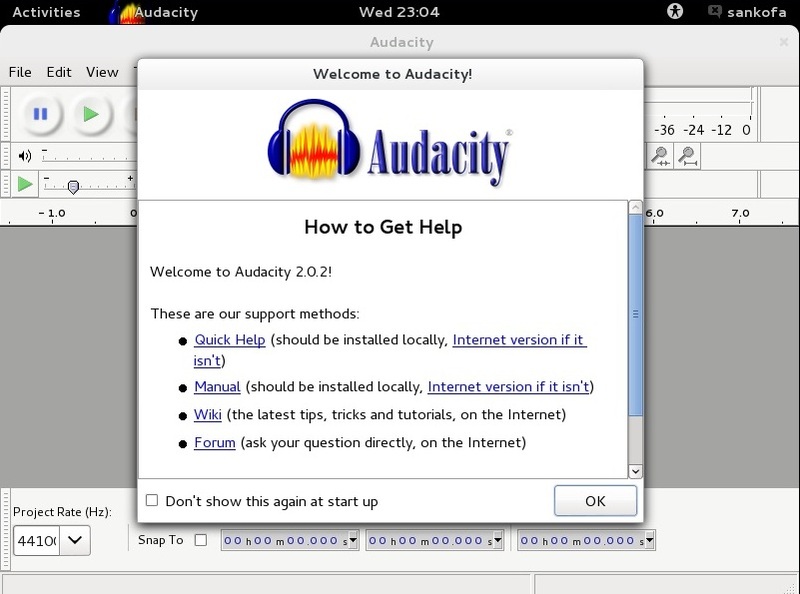 Audacity, Lame for MP, RPM, VLC Player, Wine Windows Emulator Abiword, LibreOffice, Sound Drivers, LAN Drivers, WLAN Drivers CD and DVD Burner, Sound Mixers, Sugar for Education, NTFS file System Support, Notepad, Flash Player, Flash Player plug-in, Firefox, Chrome, Opera, and a lot more popular software, Yast system manager and a loads of Games applications. All software tested. Use this format if you want to burn your appliance on CD or DVD. This is the easiest way to prepare bootable media; simply download the .iso file, and burn it to disk via any existing OS. Live discs provide a complete bootable image of your appliance which will run in a computer’s memory, rather than loading from the hard drive. This allows end users to experience and evaluate your appliance without installing it or making any changes to their existing system. Live discs are unique because they can run on a computer without a hard drive, or act as rescue systems for computers with a corrupted hard drive or file system. Use this format if you want to start your appliance as a virtual machine on VMware, VMware Player, VirtualBox, or KVM-based hypervisors. This is another method to test an appliance without formatting any hard disk. VirtualBox and VMware and virtualization applications are available for most host operating systems. KVM virtualization is for Linux only. 32 bits x86 CPU and 32bits x64 CPU for Live CD, 32 bits x86 CPU and 32bits x64 CPU for Virtual Machine. The Default surname pass word can bechanged. Documentation is coming soon. You can click on the Testdrive to test Sankofa Operating System on line. 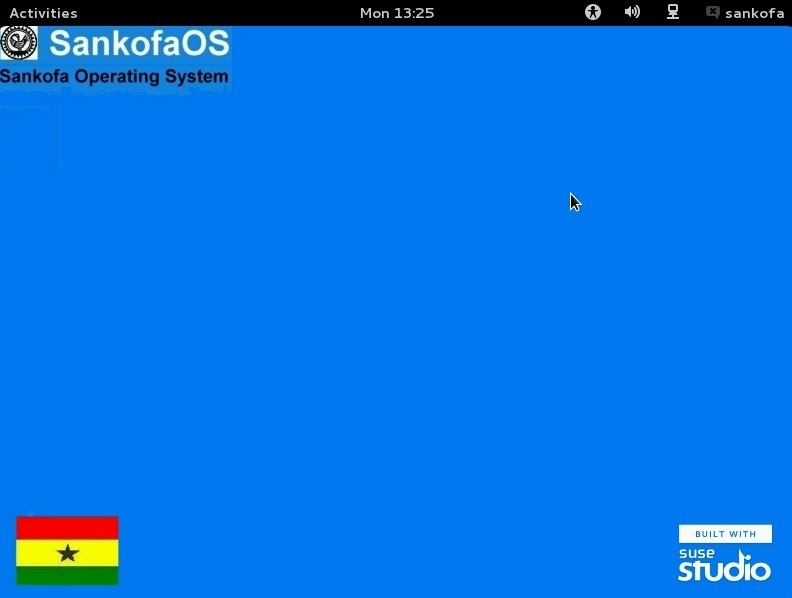 Snapshots of Sankofa Operating System for Ghana Schools.